ALopecia areata (AA) is a complex genetic, immune-mediated disease that targets anagen hair follicles  of the hair-bearing areas of the body., Atypical hair regrowth in AA is considered a rare phenomenon. We show a case of AA treated with intralesional corticosteroid with an unusual concentric targetoid hair regrowth pattern (THRP). A 28-year-old male presented a 1-year history of hair loss in the beard and scalp. He was previously treated with intralesional corticosteroid. 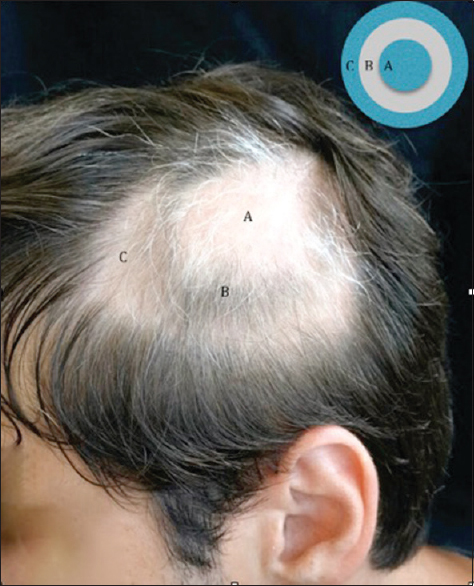 Examination revealed a single patch of alopecia on the scalp, with polycyclic aspect [Figure 1] consisting of central zone (A), intermediate zone (B), and peripheral zone (C). Zone A showed an area of thinning white hair, exclamation mark hair, and broken hair [Figure 2]a. The zone B showed healthy brown-colored hair [Figure 2]b. Zone C showed an area white hair, exclamation mark hair, and broken hair [Figure 2]c.
Hair recovery in AA usually occurs as a uniform process with thin white hair emergingfirst, followed by healthy hair. 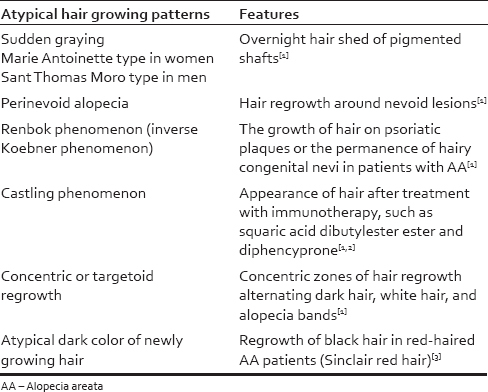 However, some authors have described atypical patterns of hair growth [Table 1].,, THRP in AA wasfirst described by Orecchia and Rabbiosi in 1988. El-Dars et al. also described a THRP in a patient with AA treated with topical corticosteroid gel. Del Río described a patient treated with intradermal triamcinolone for AA and developed a THRP. The THRP was also described by Tan and Delaney in eight patients as a possible result of the centrifugal accumulation of the corticosteroid cream. Priego-Recio et al. described paradoxical hair regrowth forms in 1.84% of the patients and the most frequent forms were THRP (43%) and castling phenomenon (43%). Ramot et al. reported atypical regrowth of black hair in two red-haired patients. A theory proposed in 1968 by Eckert et al. claims that AA occurs as an earthquake, beginning in an epicenter and expanding peripherally in a waveline manner. According to Eckert et al., an anagen/telogen wave enlarges from a core marginally expanding the alopecia. Recently, Li and Sinclair measured the hairs plucked from the alopecia patch and discussed the anagen wave theory: Initially, a single hair in telogen is triggered to enter anagen and at the same time communicates with its immediate neighbor a signal for that hair to enter anagen. The initial regrowth signal is communicated to all the hairs within the patch of alopecia in a domino fashion. Atypical hair regrowth in AA is considered a rare phenomenon but is possibly overlooked in the dermatologic literature. Our patient presented the THRP, revealing the so-called anagen wave possibly due to a hair follicle signaling that allows follicles to communicate and follows a pattern of anagen growth, as suggested by Li and Sinclair. Hordinsky MK. Overview of alopecia areata. J Investig Dermatol Symp Proc 2013;16:S13-5. Bansal M, Manchanda K, Pandey S. Annular alopecia areata: Report of two cases. Int J Trichology 2013;5:91-3. Priego-Recio CM, Rodríguez-Pichardo A, Camacho-Martínez FM. Unusual forms of alopecia areata in a Trichology Unit. J Eur Acad Dermatol Venereol 2014;28:1394-6. Cicero RL, Micali G, Sapuppo A. Paradoxical hair regrowth during the treatment of severe alopecia areata with squaric acid dibutylester (SAD-BE). Eur J Dermatol 1993;3:321. Ramot Y, Sinclair RD, Zlotogorski A. Regrowth of black hair in two red-haired alopecia areata patients. Australas J Dermatol 2012;53:e91-2. Orecchia G, Rabbiosi G. Patterns of hair regrowth in alopecia areata. Dermatologica 1988;176:270-2. El-Dars LD, Kamath S, Logan R. Targetoid pattern of hair regrowth in alopecia areata: A case report. Clin Exp Dermatol 2009;34:413. Del Río E. Targetoid hair regrowth in alopecia areata: The wave theory. Arch Dermatol 1998;134:1042-3. Tan RS, Delaney TJ. Letter: Circular regrowth in alopecia areata. Br J Dermatol 1975;92:233-4. Eckert J, Church RE, Ebling FJ. The pathogenesis of alopecia areata. Br J Dermatol 1968;80:203-10. Li J, Sinclair R. Clinical observations in alopecia areata: Implications and hypotheses. Australas J Dermatol 2016;57:e29-31.